Most of us have experienced the enjoyment of purchasing a new piece of furniture at one time or another and cleaning it by professional cleaners such as Carpet Cleaning Orange County - whether it be casual outdoor furniture, a new accessory for the children's room, or a piece of contemporary furniture for the lounge. In our opinion, nothing beats the luxurious touch and feel of genuine leather upholstery. Now, while the purchasing process may be fairly straightforward, the process of caring for and cleaning leather furniture is more challenging. We tend to get nervous when thinking about leather furniture cleaning because leather is a natural product, and tends to stain more easily than upholstery based on synthetic materials such as PVC. In many cases consumers may decide to tackle the task of leather furniture cleaning by themselves, using a number of tried and tested methods, for example, getting out pet stains with vinegar or a mild detergent solution. Another trick that I also use is to place talcum powder or baking soda over a spill in order to absorb the liquid. However, using the wrong kind of cleaning product on leather furniture can have disastrous results, making the original stain look mild by comparison. 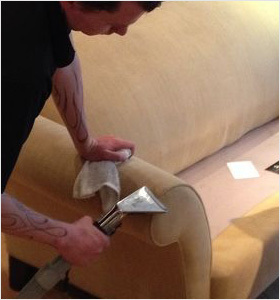 Even commercial upholstery cleaning products warn consumers to test the product on a non-visible area prior to using it to remove the stain. If you prefer not to put your valuable leather furniture at risk, the process of leather furniture cleaning may best be left to the professional's of UCM Services Orange County. While most of us are familiar with professional carpet cleaning services in the context of carpets or rugs, what we may be less aware of is that these cleaning service providers also offer excellent service and knowledge when it comes to cleaning upholstery and furniture. 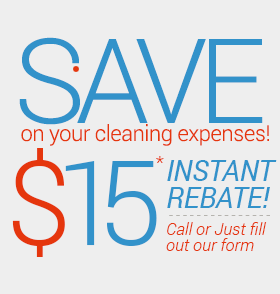 With the right knowledge and experience, the same carpet cleaning machines and carpet cleaning products can be put to extremely effective use on everyday upholstery, including leather furniture cleaning. In addition, professional cleaning services also offer great advice on how best to look after and care for furniture. After speaking to a cleaning expert he explained that when carried out properly, steam cleaning can actually aid leather furniture cleaning as it expands the pores of the leather to force out all of the dirt trapped inside. Another good piece of advice that I received regarding leather furniture cleaning is that prevention is better than cure. By applying a recommended leather protector to newly purchased leather furniture, you can protect it right of the bat, prolonging the life of the upholstery and limiting any possible future damage. So, by using some simple yet effective cleaning techniques and tricks, as well as the aid of UCM Services Orange County services, your leather furniture should provide you with years of comfort and keep looking good under any circumstances.